In 12-inch skillet, heat oil over medium-high heat. Add chicken and salt; cook 4 to 6 minutes without moving, until browned on first side. Stir; cook 1 to 3 minutes longer or until no longer pink in centre. Using slotted spoon, transfer to medium bowl; set aside. 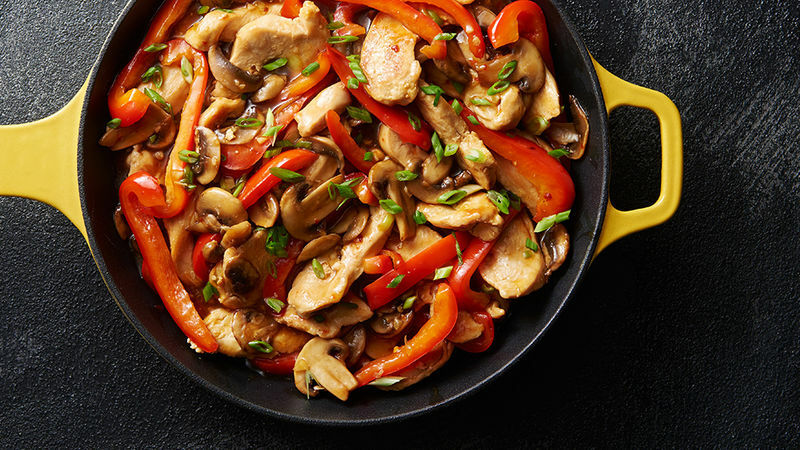 Add mushrooms, bell pepper and green onion whites to oil in skillet. Cook over medium heat, stirring occasionally, 4 to 6 minutes or until softened. Stir in broth, brown sugar, soy sauce, chili garlic sauce and garlic. Heat to simmering. Meanwhile, in small bowl, beat rice vinegar and cornstarch with fork. Stir chicken and rice vinegar mixture into mixture in skillet. Return to simmering; cook 15 to 30 seconds, stirring constantly, until thickened. Serve over rice. Top with green onion greens.